What do Fishing, Genealogy and Detecting Have in Common? This old photo provides proof to the saying “Your eyes are bigger than your belly”. The other day I was thinking how much my life has changed since I started metal detecting. The people I’ve met, the places I’ve been, and the finds I’ve discovered all were the result of a hand held machine that beeps. 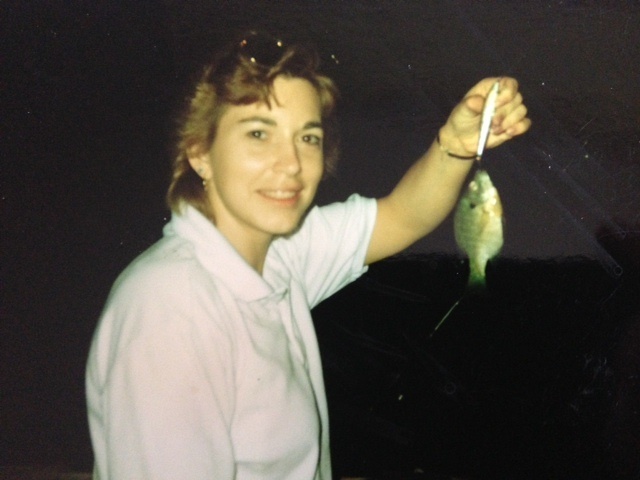 Before I took up detecting, my passion was genealogy, and before that, fishing. At one time, it was not unusual to see me with my face buried in some book, or walk into a room littered by my family papers scattered about. Research trips out of state to visit forgotten cemeteries and obscure town halls were the norm. My fishing days went into immediate decline after I changed my mind and decided I didn’t want to eat the three nice trout from the stream with the questionable water quality, and upon release, they failed to revive. One of my pet peeves is wasting food, especially if a creature gave its life to become your meal, and I still feel a little guilty about that incident. It then occurred to me that all of the hobbies I have found myself involved in have similar elements and rewards in common. Whether in archives, the woods, or next to a good trout stream, the intention is always to find something. Whether I’m searching for an old coin, an elusive ancestor, or that one great fish, hunting is my real passion. And since over time, the need to hunt for survival is no longer an issue; I fulfill the hunting instinct in other, more humane ways. Today, my genealogy papers are in disarray, smelling a little dank after being rescued from a flooded basement a few years back, and my Ugly Stick is leaning against a corner wall, having become the perfect venue for a homeless spider. And though I still yearn for my old hobbies on occasion, my machine always has a freshly charged battery and spends most of its time in the trunk of my car (just in case), because metal detecting always supersedes. ~Happy Hunting! I was an avid trout fisherman years ago, and was up before the sun to hit the waters before work. .This is true of many of my detecting friends. Must be the anticipation of the find or the catch? Sold all my gear a few years ago after moving to the Dallas area. Wouldn’t eat anything that came from the waters here. I’ve heard a lot of people say that if you like fishing, you’ll like detecting. Guess there’s some truth to it. I think it’s both the anticipation and the catch. Pretty sad though that we’re afraid to eat fish from our own waters.